← A Year of Stanley – Continued! Ok, back to summarizing the adventure. As some of you know, just over a year ago, I quit my miserable corporate job and decided to veer away from the life/career path that I thought I was “supposed” to be on. Thus began my journey on the road, where I used the sharing economy to live somewhere new every month. 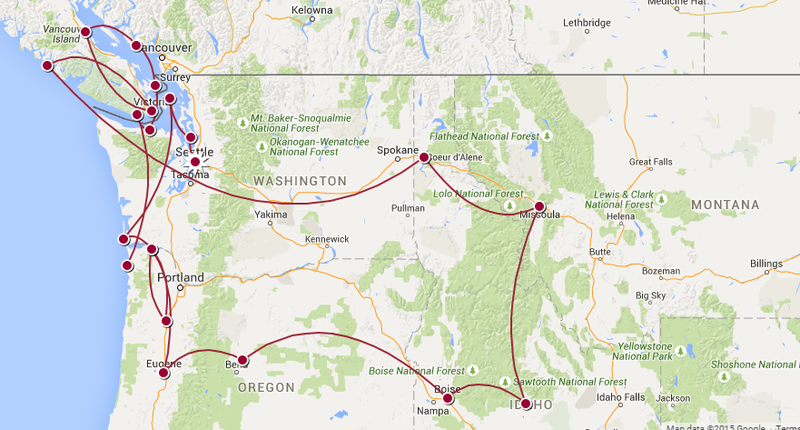 Over the course of a year, I lived in about 20 different Airbnbs in 19 different towns across the U.S. and Canada, where I spent my time doing freelance work, living like a local, and playing tourist/adventurer. A lot of people have asked how I chose the different destinations. And I have to say…my process for this really wasn’t all that sophisticated, and that was actually pretty intentional. I didn’t want to go to places that I had always “dreamed” of going, and I often didn’t choose what anyone might think of as “ideal” locations. I wanted to learn new things. I wanted to understand why I liked certain places, and why I didn’t like others. I wanted to go to locations that weren’t popular destinations. Locations that might not be perfect, that might offer some challenges, some things to work around. And I just don’t think you go through the same kind of process when you’re hopping from Paris to London to Sydney (though that route very well could be my NEXT adventure!!!). I wanted to go to places not simply based on my preconceived notions of myself. I wanted to be open to reassessing what sustains me and to discovering new patterns and pleasures. And what I found by doing this was that it’s never too late to be surprised and to find out completely new things about yourself. For example, all of my life I’ve thought I was a “city girl”. But over my adventure, I learned just how much calmer and how much more I thrive in quiet, natural settings, and how much the noise and chaos of a city can send my heart rate sky rocketing. This entry was posted in Life on the Road and tagged adventure, airbnb, destinations, inspiration, introspection, pacific northwest, self-discovery, sharing economy, travel. Bookmark the permalink. Keep me updated! It seems awesome so far. Great post! Sounds like such a great simple awesome time! Can’t wait to read more! Safe travels! 🙂 thank you so much! !